« Eye View Pop Culture, Michael Jackson Going On The New Classic Pepsi Cans, What About Coke? SAN FRANCISCO (Reuters) – Two of the three American hikers jailed in Iran after allegedly straying over the Iraq-Iran border in 2009 were to be married on Saturday in a private ceremony in California, according to a statement posted on their Facebook page. The wedding of Shane Bauer and Sarah Shourd completes an engagement that began when Bauer tied a ring of thread around her finger while they were in prison in 2010. “Now that this day has come, all I can do is close my eyes and fill with gratitude, for our freedom, for the love of so many generous people around the world, and for the very soil under my feet,” Shourd said in the statement posted on the Free the Hikers Facebook page. 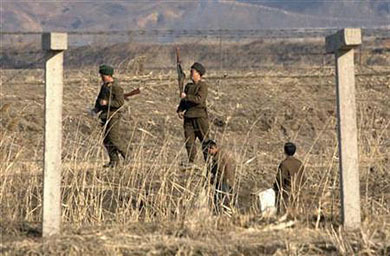 Wedding party follow ceremony with romantic stroll along North Korean border. This entry was posted on May 6, 2012 at 3:39 am and is filed under Uncategorized. You can follow any responses to this entry through the RSS 2.0 feed. You can leave a response, or trackback from your own site.